A rising star in the stop-motion field, Heather Colbert returns to Directors Notes with her latest animation – a dreamy music video for Tom Rosenthal track ‘How Have You Been?’. Based around research on sleep, the three-minute piece combines stop-motion with hand-drawn animation to create a delicate piece with an ethereal feel. Heather joins us to discuss the influences on her storytelling, employing a combination of techniques and what she’s working on next. Last time we spoke, we were discussing your Dolly Said No To Elvis music video for Mark Nevin, that video has proved quite popular online clocking up almost 150k views on Vimeo, were you pleased with the response it got and what have you been working on since? It was so surreal watching that happen. It was my second professional commission as a director and the set up was so make-shift that I never expected such a response. But of course, I’m very excited that so many people saw the film. Last year I was doing a few different things; I was back at my university in Cambridge, working as a studio supervisor and during that time I also co-created some puppet-making workshops at the museum of Cambridge. The most exciting adventure was travelling to Terrassa in Spain to help my friend Abel Carbajal to make the puppets for his film El Gran Correlli. It was an absolute dream to work with him and to have that collaborating feeling again after making ‘Dolly’ on my own. He is a very gifted animator and it has been extraordinary seeing our puppets come to life like that. I was also very fortunate to have some work experience in the autumn – I had the amazing chance to spend three weeks at Aardman Features. I was very lucky to be able to learn from the great teams in the art, model making and assistant animator departments. So it’s been a real mix of challenges since that music video. One of the things you’ve obviously been working on is this fantastic new music video for Tom Rosenthal’s song How Have You Been?, can you explain to our audience how you came to direct that video and explain the narrative? This was the first project I had initiated myself. I had greatly admired Tom Rosenthal’s music and had wanted to work with him for a while. He has a huge catalogue of live action and animated videos created for his music, so I sent him a message with a few examples from my portfolio and asked if he’d be interested in collaborating. When he sent me this song, he explained the album was to be about sleep and the aim was to relax the listener. How Have You Been? is so dreamy, I thought the way he constructs the song using only his voice is so beautifully cool and calming. Even though I was listening to the track in the heat of summer, I began to see dark nights and glowing eyes, very nocturnal and natural images. The idea for me began with researching stories and myths around sleep. I am happy for the film to be interpreted in many ways – and I have been surprised and delighted by people’s different takes on the story; they bring their own experiences to the characters. But the idea for me began with researching stories and myths around sleep; finding Hypnos, the god of sleep, and variations of The Sandman and The B.F.G. as inspirations for my character’s task. ‘Hypnos’ sees what humans are dreaming. If they are distressed and troubled by them, he sprinkles his sand to calm their thoughts and give them more peaceful dreams, which he then sends back off across the sea. I saw him as a creature trying to do good but hindered by his fear of the world around him. Hopefully, it can also be read as a simple story of connection – two creatures finding, trusting and comforting each other in a secluded world. What made you choose this story and did the song have any influence on the narrative? From my research, I knew that there was a lot for me to play with, in the themes of sleep and dreams, but it did take me a while to find the story. I took a lot of inspiration from the song. I could see the visual language I wanted to use quite clearly, and the line “I woke up, but it didn’t go away” seemed to express an aspect of living with depression, but I couldn’t find the missing link to connect these two pieces until I decided to include a personal experience. A recent realisation that everything within our psyche is trying to look after us, even the parts that trouble us, or that we dislike. Every behaviour and tendency is trying to do the same job; to protect us from harm. From these three elements, I wanted to keep the story simple, using just two characters to represent two sides of one mind. I chose to make them black and white to echo the Yin and Yang symbol of negative and positive forces complimenting each other. I wanted the embrace at the end, between Hypnos and Shadow, to be about acceptance and kindness towards all sides of yourself. The video combines stop-motion and hand-drawn animation – can you explain what made you adopt this approach and what you think it adds to the piece? I love the way adding drawn animation to stop motion can enhance the feeling of magic and ‘other-worldliness’. I also really admire the exceptional way Pèter Vácz plays with this combination in Rabbit and Deer, to separate and integrate the characters’ worlds. I have experimented with this convention in previous videos but with this project, I saw the opportunity to push myself and use it to fulfil a slightly different role. I wanted to animate ‘Shadow’ as an ethereal 2D shape in a stop-motion world, to show she is a different kind of being. They are both inhabiting the same space but are of different states. She starts off fluid, like a liquid or a gas, eventually becoming more solid and furry as she gets closer to and mimics Hypnos. Can you tell us a bit about the production – how long did it take? What equipment did you use? Any other interesting stories? I was working on the project at Hangar Puppet Animation Studio in Bristol for about 3 and a half months over the summer. We were also building parts of the studio in between the shoot but thankfully Tom was very accommodating with his deadline! I really appreciated the days when the others were in the studio – being able to talk things through with Joseph Wallace, Roos Mattaar and Marie Lechevallier was so valuable and supportive. The move into Hangar also meant the first opportunity I’ve had to use a moco rig (built and kindly lent to our projects by Simon Tytherleigh), which was so exciting and gave me more freedom to create movement within the cave. The style I am trying to build is very focused on hand-made textures and I want to keep as much happening in front of the camera as possible, but I did have a moment to be thankful for modern technology and social media in the edit. 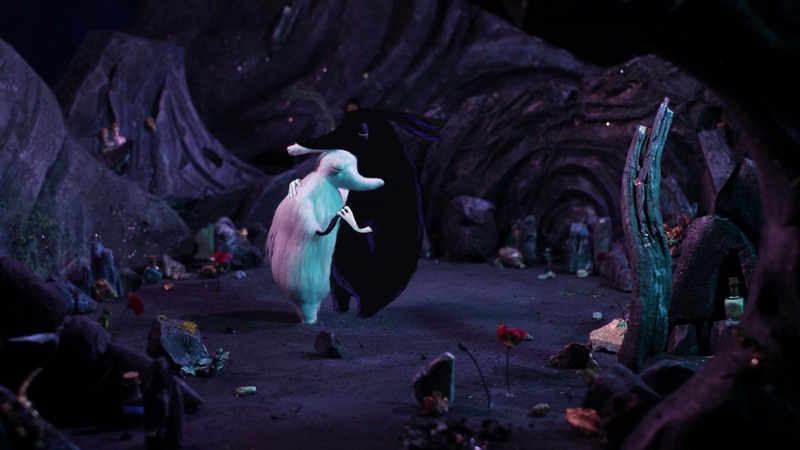 The task of getting a real puppet and a 2D shape to hug convincingly, in a shot where the camera is moving, needed a lot of technical assistance! I am so grateful to Abel Carbajal for teaching me (through an intricate virtual tutorial via online messenger!) how to create that moment in After Effects. I was even commissioned to create a little plushie toy version of Hypnos for one of Tom’s fans! The video has been out for a little while now and so I can say the response from people who have watched it, particularly on YouTube, has been amazing. I was even commissioned to create a little plushie toy version of Hypnos for one of Tom’s fans! The aim of trying to create characters that were not human, and not quite animal either, was to let as many people identify with their emotions as possible. Reading that people can see themselves in the characters means such a lot. I really enjoy the process of making the music videos, there is such freedom but the constraints make it a safe space to experiment and grow. I hope to continue making and learning about this amazing industry and I think the next challenge for me to attempt is to make a narrative film that stands on its own. We are going to apply to the BFI short film fund for emerging directors which is now open to animation. I am teaming up with an amazing modelmaker friend, Becky Weston, who has just graduated from the new NFTS course. We are passionate about pushing the medium of stop-motion and are working on ideas at the moment. We are going to apply to the BFI short film fund for emerging directors which is now open to animation. I was particularly inspired by the female directors, of both live action and animation, screened at Encounters Film Festival in Bristol, 2018. It feels like a very exciting time to be making films and telling stories.